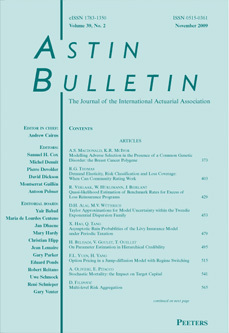 ASTIN Bulletin - The Journal of the IAA was founded in 1958 as a journal providing an outlet for actuarial studies in non-life insurance. In the late 1980's the journal extended its scope to encompass the study of financial risk in insurance (AFIR). In 2007, the journal was established as the journal of the International Actuarial Association (IAA) and encompasses all of the scientific sections of the IAA. ASTIN Bulletin - The Journal of the IAA publishes papers that are relevant to any branch of actuarial science and insurance mathematics. Papers should be quantitative and scientific in nature, and might draw on theory and methods developed in any branch of the mathematical sciences including actuarial mathematics, statistics, probability, financial mathematics and econometrics. The journal welcomes papers that present significant and original theoretical developments and papers that present significant and original applications of mathematical, statistical or econometric theory to problems arising in insurance, pensions and finance. We especially welcome papers opening up new areas of interest to the international actuarial profession as well as papers that describe open problems that have arisen in practice. ASTIN Bulletin is abstracted and indexed in the Social Sciences Citation Index, the Science Citation Index Expanded, the CompuMath Citation Index, and Current Contents/Social & Behavioral Sciences; MathSciNet; Zentralblatt MATH; Scopus; CrossRef; Thomson Scientific Links. ASTIN Bulletin is a peer-reviewed journal.